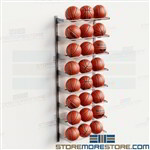 Wall mounted athletic equipment racks store sports balls, shoulder pads, tennis racquets, and other sports equipment efficiently and in less space while maintaining organization. 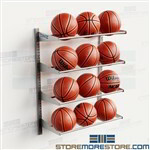 Wall mounted basketball racks have adjustable shelf levels for customized athletic gear storage according to your specific needs. 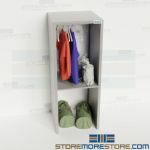 Available in multiple sizes, the racks keep your sports gear organized and off the floor while using your wall area to save floor space. Stainless steel wall-mounted or freestanding canoe racks provide accessible and space-saving storage for kayaks, surfboards, and other marine or sports equipment. 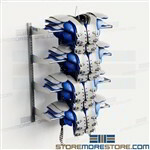 Wall-mounted storage racks stack shoulder pads and football gear neatly and off the floor. 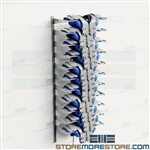 The football racks are easy to install and stack 4 to 6 high depending on the size of stored shoulder pads. 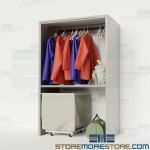 Golf back storage racks provide organization and space savings for country clubs, universities, and municipal golf courses. Two tiers of storage provide more space in a smaller footprint, and bag dividers facilitate ease of use and proper, safe storage of equipment. 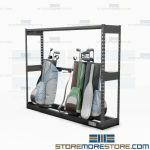 Slider shelving units are designed to store and organize golf clubs and golf bags in less space with tracks that slide the shelves side-to-side to provide greater storage density in a smaller footprint. 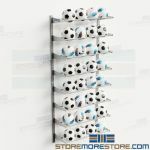 Wall mounted soccer ball and volleyball racks are ideal for storing and organizing all types of athletic gear. 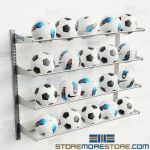 The adjustable shelving levels make it easy to store everything from football pads to soccer balls, volleyballs, basketballs, and more.